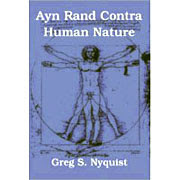 Ayn Rand Contra Human Nature: Atlas Shrugged Movie in Actually Quite Good Shock. If the film does well, I imagine the ARI will want to get some attention. I suppose it all depends on what Leonard Peikoff says. IF the film does well, Leonard Peikoff may have little choice but to at least give it a partial endorsement of it. I suspect many of the rank and file are beginning to become exasperated with LP and his tendency to denigrate anything that didn't meet with his approval. Years of regarding David Kelley, libertarianism, conservatism and the GOP as the chief enemies may be catching up to him, particularly when wishes to feed the ARI faithful the unsavory diet of David Harriman and DIM. "The bad guys sometimes seemed cartoonishly venal rather than arriving at their badness through some sort of logic. I didn't really understand why Dagny put up with her no-good brother for even one second." However fine an adaption this movie might turn out to be, problems in the book are going to be at least a bit of a drag on it. And it will only get worse as the book proceeds. Good point, Greg. I almost forgot that the first third of the book is the decent part. "I didn't really understand why Dagny put up with her no-good brother for even one second." Didn't James Taggart inherit the company? If she wanted to work for Taggart Transcontinental, she had to put up with him. Maybe this isn't clear in the movie. "And it will only get worse as the book proceeds." Depends on how they handle it. The later parts of the book are more melodramatic, but also potentially more cinematic. Having apparently underestimated these guys already, I'm leery of making the same mistake twice. My guess is that they will eliminate the most far-fetched stuff, like Project X, and concentrate on Dagny's conflicted feelings about saving the railroad and joining the strike. The rescue of Galt from the clutches of the government goons could be either laughable or exciting, depending on how it's done. The delicious dualities of Objectivism are already blooming in the reactions of the invited audience to the private screening of the whole movie. Barbara Branden and Verum Serum (a film blogger who finished reading AS two weeks before the screening, and sat with Nathaniel Branden and David Kelley at the munchies) loved it. Another film blogger (Franken?) and an invited guest who reported to Objectvist Living (CNA) were disappointed and pretty much hated it. I just can't wait to see events unfold. It almost eases the pain of living in Toronto at hockey playoff time. "Why Dagny put up with her no-good brother..."
On archn we have met a few perplexed very-good brothers putting up with newly-Objectivist brothers whom they consider crazy but never no good. (the Ob-Anon aspect of this site is highly underappreciated). Maybe Rand was more human than we think. "The later parts of the book are more melodramatic, but also potentially more cinematic." And also increasingly preposterous. Of course, people's taste differs on these matters. As the typical action or sci-fi movie demonstrates, people will tolerate all kinds of gross implausibilities if only the story is exciting and the characters charismatic and good-looking. The problem with I have with Atlas is I just don't find the working out of its premise in the least credible. The earlier portions of the novel tend to be less implausible because it comes off merely as somewhat heavy-handed satire on government intervention. The producers of this film seem to taken out the heavy-handed aspect and produced a better result. But how they handle some of the absurdities which begin dominate the last third of the novel will prove a huge challenge. How are they going to handle Galt's speech, which is not only way too long, but a rather angry, even offensive pseudo-philosophic rant, with lame tautologies alternating with indignant scolding. Or what about that utterly laughable and embarrassing torture scene, maybe the most absurd thing in all of Rand's fiction? And whose going to take on the unenviable role of John Galt? Even if the writers are able to somewhat humanize role, what actor can pull the role off without being upstaged for the guy they got playing Rearden? I doubt if even Daniel Craig could pull it off. Objectivists might have blundered by exposing their foundation myth to a population not indoctrinated in advance to interpret it in the "right" way. Assuming that the rest of this film get made, and that it adheres closely enough to the novel, I wonder how American audiences, representing demographic reality, will react to the message that they deserve to die because they don't measure up to the movie's fictional heroes. An accurate movie would also have the problem of handling Galt's implied adult virginity, love-obsessional stalking of Dagny and his underemployment. He sounds like the sort of "unsub" character who threatens an innocent woman in an episode of Criminal Minds. Greg, please. The torture scene will not be laughable or embarrassing, it will be the philosophical and emotional climax of the film and have a cast of thousands. I suspect Rand wrote the torture scene in response to Winston Smith's torture in Nineteen Eighty-Four, with Jim Taggart playing the role of Inner Party member O'Brien. Only in something approximating real life they would have figured out the bit about Dagny as Galt's weakness, and used it to break him like in Smith's "Do it to Julia!" moment. "Or what about that utterly laughable and embarrassing torture scene"
If the whole trilogy (or will it be a tetralogy?) does get made, we'll see how they handle it. Personally I don't see a big problem with the electroshock scene. I've seen that kind of thing in countless movies and TV shows. It can be done realistically, as in the movie Three Kings, or in a more campy way, as in the TV show Alias. It usually works pretty well as a dramatic device. And I think the moment when Galt tells them how to fix their broken torture machine is pretty great, actually. If the actors can pull it off, the audience will cheer. We'll see. Galt's speech? Clearly it will be cut to just a few minutes. Gary Cooper gives a 7-minute speech in The Fountainhead; despite Cooper's wooden delivery, I thought it worked pretty well. Well if a movie insults it's core audience then those who made it can hardly complain if the audience stays away...who can forget Carry on at your convenience? The UK was in the grip of the unions and this film bashed the unions in a heavy handed and unfunny way. Which was dumb as the people that actually went to watch Carry on films were members of the working classes, i.e the ones that actually join unions in the 1st place. Peikoff will never watch the movie. My guess is that he will condemn it in a straightforward, business-as-usual way. I would be surprised of Peikoff sees the movie. I think he has too much invested in his anti David Kelley past. If this page is accurate, it looks like the DIM book might be appearing soon. Well, Yaron Brook has seen "a screening or some such" according to the attractively-named Capitalist Swine on Oonline. Some such? The trailer? The CPAC rollout? The preview? Was he seated next to a Branden? "Well, Yaron Brook has seen "a screening or some such" according to the attractively-named Capitalist Swine on Oonline." Alas poor Yaron! If this movie attracts people to Objectivism, he could be put in a very difficult position, particularly if Peikoff denouce it without seeing it. What are new adepts to the philosophy going to think when the very movie which attracts them to Objectivism is denounced by the very institution ostensibly dedicated to its advancement? Doesn't Brook have to convince Peikoff not to denounce the movie, but at the very least keep quiet about it? And does Peikoff realize how weakened his position is, following the McKaskey scandal, his coolness toward the Tea Party, and the fatwa against the GOP (which looks particularly foolish in the light of Obama's election)? In the last five years, what person or institution has done more harm to the spread of Rand's ideas than Leonard Peikoff? Enquiring minds want to know. "according to the attractively-named Capitalist Swine"
That is a nice name. If I ever have a son, I'm going to name him Capitalist Swine. Heck, or a daughter, even. Peikoff couldn't have done more harm to Objectivism if he tried. But they guy's got all the marbles. And he obviosuly has something against Kelley, as I'm sure Yaron Brook knows.